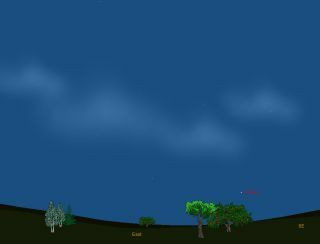 This sky map shows the location of Sirius, the Dog Star and brightest star in the night sky, as it appears before sunrise at 6 a.m. on Aug. 13, 2011 in mid-northern latitudes. The so-called "Dog Days" of summer in the Northern Hemisphere officially came to an end this week, when the Sirius, the bright Dog Star, returned the night sky. Everyone talks about "Dog Days" but few may know what the expression actually means. Some might suggest it signifies hot, sultry days "not fit for a dog." (If during you live in Dallas or Oklahoma City this summer, you may probably more than agree with this particular definition.) Others, meanwhile, may say it's the weather in which dogs go mad. But the actual Dog Days, or "Canicular" days as they're known, are defined as the period from July 3 through Aug. 11 when the Dog Star, Sirius, rises in conjunction (or nearly so) with the sun. As a result, the classical Greek and Roman belief was that the combination of the brightest luminary of the day (the sun) and the brightest star of night (Sirius) were responsible for the extreme heat that is experienced during the middle of the northern summer. Other effects, according to the ancients, were droughts, plagues and madness. In ancient Egypt, the New Year began with the return of Sirius. It was, in fact, the "Nile Star" or the "Star of Isis" of the early Egyptians. Interestingly, some 5,000 years ago, this star's "heliacal rising" (appearing to rise just prior to the sun) occurred not in August, as is the case today, but rather on or around June 25. When the ancient Egyptians saw Sirius rising just before the sun, they knew that the "Nile Days" were at hand. Its annual reappearance was a warning to people who lived along the Nile River. The star always returned just before the river rose, and so announced the coming of floodwaters, which would add to the fertility of their lands. People then opened the gates of canals that irrigated their fields. The statue was oriented to the rising of Sirius, so that the light from the returning Dog Star would fall upon the gem. When the priests saw the light of the star shining upon the gem for the first time, they would march from the temple and announce the New Year. In the temple appears the inscription: "Her majesty Isis shines into the temple on New Year’s Day, and she mingles her light with that of her father Ra on the horizon." This week, just before sunrise, Sirius can again be glimpsed rising just above the southeast horizon for those living in mid-northern latitudes. At more southerly latitudes, Sirius is already conspicuous, twinkling above the horizon at dawn. The star appears a brilliant white with a tinge of blue, but when the air is unsteady, or when it is low to the horizon as it is now, it seems to flicker and splinter with all the colors of the rainbow. At a distance of just 8.7 light-years, Sirius is the fifth-nearest known star. Among the naked-eye stars, it is the nearest of all, with the sole exception of Alpha Centauri. So regardless of how hot your local weather is, or has been, this appearance of Sirius — a star we most associate with the winter season — now rising just ahead of the sun, is a subtle reminder that the hottest part of the year is now behind us and a promise that a change toward cooler weather is only weeks away.